Click here or on any of the images below to view full details of the villa. 6 double/twin bedrooms and 5 bath/shower rooms – sleeps up to 12. A stunning hilltop villa and Romanesque style pool situated between Avignon, Orange, Mont Ventoux, the Luberon, St Remy de Provence, Arles, the Camargue, Montpelier, Nimes, Uzés and the Pont du Gard. Built around an old stone tower and renovated with immense style and an abundance of love and care to provide a very high standard of accommodation combining old style charm and original Provencal features, with modern day comforts. This spacious Provence villa accommodates any number up to 12 or 13 people, and with substantial discounts for lower occupancy, it is as perfect for 2 as it is for any number from 2 up to 12. 6 doubles or twin bedrooms, 5 bath/shower rooms/WCs. Please see prices/dates/occupancy tables. If you would like to rent the optional extra 'La Petite Villa Romantique', it accommodates a further 1 to a maximum of 4 people. It is £350 per week to £650 per week depending upon the time of year. It cannot be rented as a separate let - only in addition to the main villa, if you require it. By car, take the autoroute and drive via either Paris or via Reims, south to Lyon and then to Avignon. 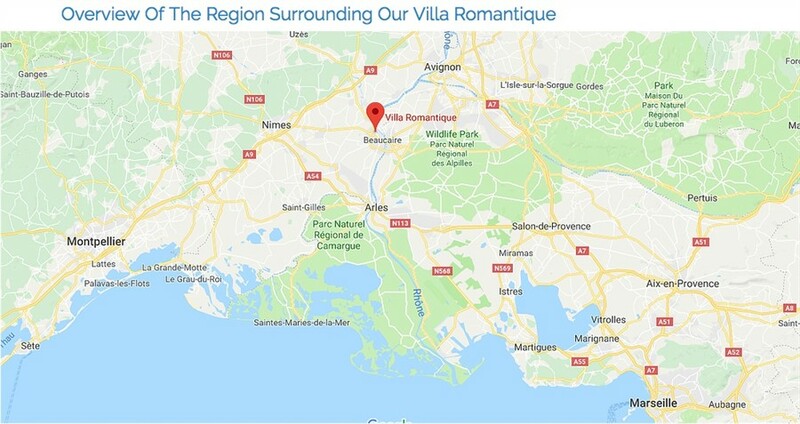 Villa Romantique is situated 10 miles south of Exit 23 on Autoroute A9 (take the signpost for REMOULINS, BEAUCAIRE/TARASCON) OR 20 miles west of Exit 25 on Autoroute A7 (take the signpost for St. REMY de PROVENCE). Fly direct to the airports at Nimes, Montpelier, Marseille, Nice or Avignon and hire a car. Take the TGV fast train to Avignon and hire a car, or take your own car by Motorail to Avignon.